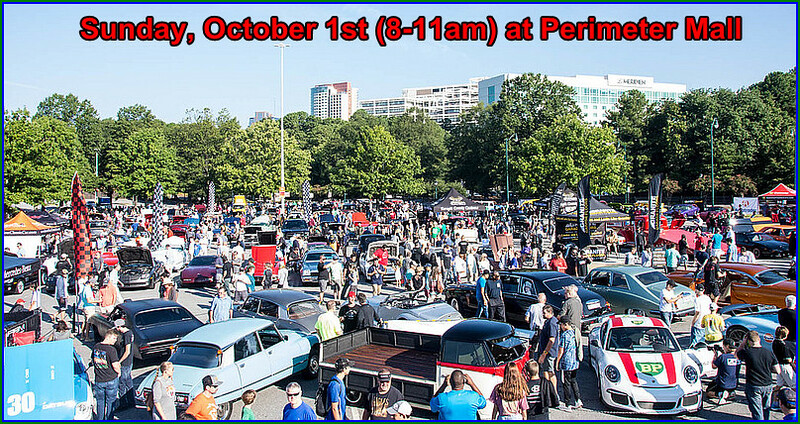 Caffeine and Octane auto show this Sunday morning at Dunwoody's Perimeter Mall from 8 to 11 am. Caffeine and Octane is a nationally recognized all makes, all models car show that regularly attracts over 2000 vehicles and 15,000 fans. The event is held (rain or shine) the first Sunday morning of each month from 8AM - 11AM at Perimeter Mall, located on the Northside of Atlanta in Dunwoody GA. The Caffeine & Octane faithful get up very early to watch the parade of hundreds of cars that begin arriving well before sunrise. European and Japanese cars are well represented, including exotic cars and tuner cars. We also feature cars that defy known automotive niches. If has wheels and a motor, you'll find it at Caffeine & Octane! 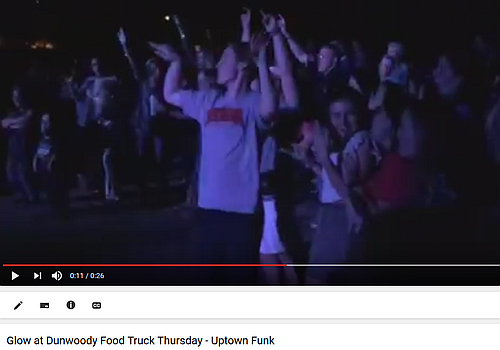 One thing we guarantee is you'll always see something new at every show. 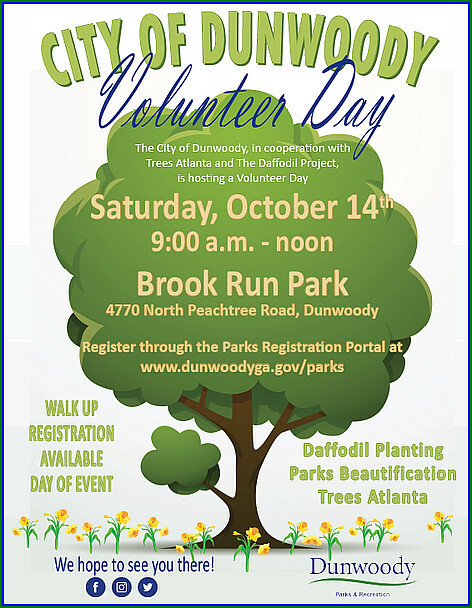 Saturday October 14th 9:00 p.m. - 12:00 p.m. at Brook Run Park (4770 North Peachtree Road, Dunwoody) The City of Dunwoody, in cooperation with Trees Atlanta and The Daffodil Project, is hosting a Volunteer Day. This is the community’s chance to clean, shine and fix-up Dunwoody by helping to plant daffodil bulbs along the Dunwoody Trailway. Interested participants will soon be able to register for the event. This volunteer event will help plant thousands of daffodils in Brook Run Park in memory of the 1.5 million children who perished in the Holocaust and in support for children suffering in humanitarian crises in the world today. In addition, Trees Atlanta will also host a Dunwoody Tree Sale featuring the best native and exotic plants available – including 200 species of trees, shrubs, native perennials, and tree-friendly vines that provide habitats for our furry and feathered friends. Interested participants can register for selected volunteer activities via the Dunwoody Parks Registration Portal at www.dunwoodyga.gov/parks -- this event will be held rain or shine. 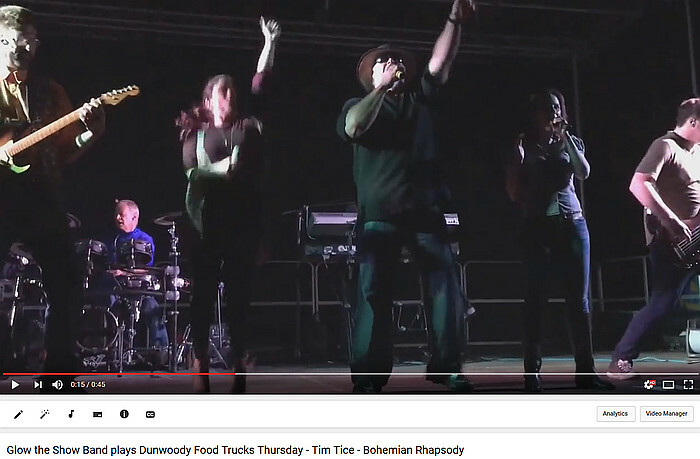 Save the Date - GLOW the Show Band to close out Food Truck Thursdays on Oct 26th - Highly Recommend!! Peachtree Charter Middle School CV Classic 5K scheduled for Sat Oct 28th - registration prices going up soon. Join Peachtree Charter Middle School for the 8th Annual CV Classic 5K Road Race. 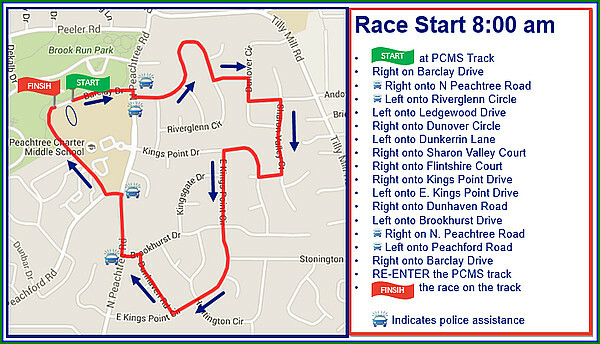 The course will start and end on the PCMS track. The 5K begins at 8:00 a.m. (7:45 a.m. kick off). **Register before Oct. 8th to guarantee a quality athletic, dri-fit shirt. We need volunteers! Click Here to Sign Up to Volunteer. The early registration fee of $20 per runner has been extended through September 29. Starting September 30, the fee increases to $25 per runner. Online registration closes October 23 at midnight. Race day registration is $30. Registration fee includes a quality athletic, dri-fit shirt. T-shirts are only guaranteed through October 8. Each student will receive 2 CV passes when they run the entire CV Classic 5K race, only 1 CV pass if they register but do not run. A CV pass is a pass a student gives their PE coach that allows them to skip CV running on a Monday of their choice and still receive a grade of '100' for the day. TO REGISTER MORE THAN 1 RUNNER: When you click "Add to Cart", go to "My Account", and under "Forms" you will see a link for CV Classic registration (the one without a green check mark). Click on that and then you can add more runners. For $100, your family can be featured on the PCMS CV Classic t-shirt, which will be worn for years to come! One race entry, one t-shirt and one additional CV pass are included with your Family Sponsorship. Your business can be featured on the PCMS CV Classic t-shirt and website. Race entries and other benefits included with your Corporate Sponsorship vary depending on the sponsorship level. Read more about Corporate Sponsorship opportunities by clicking the link! Race Bag Pickup: Race bag pickup, including t-shirts and race numbers, will be on Thursday, October 26 from 4:00 - 6:00 p.m. and Friday, October 27 from 8:30 a.m. - 4:30 p.m. in the PCMS front lobby. On Saturday, October 28, race bags for pre-registered runners can be picked up starting at 7:00 a.m. Parking: Parking will be available at Peachtree Charter Middle School and Brook Run Park. 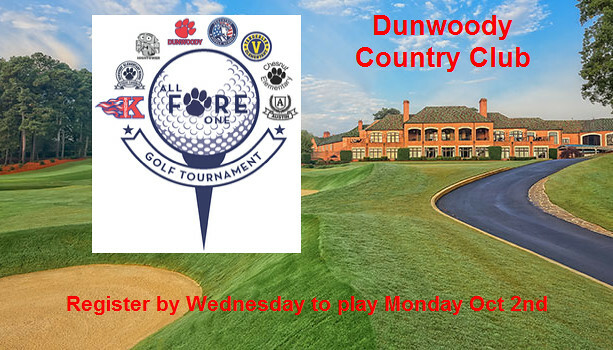 All Fore One Dunwoody community golf tournament: benefiting capital improvements and educational enrichment at Dunwoody High School and Peachtree Charter Middle School. A big Thank You to the Dunwoody Elementary PTO for assisting us with the registration process! ​ By clicking the 'Register' link above you will be redirected to their PTO site to continue checking out. FIRST READ: SLUP 17-03: Jessica Hill of MMM Law, Attorney for Trammell Crow Company, the Applicant for a Portion of 1134 Hammond Road (Tax Parcel ID 18 348 01020) and 4400 Ashford Dunwoody Drive, Dunwoody, GA 30346 (Tax Parcel ID 18 348 01006), Seeks a Special Land Use Permit per Chapter 27, Section 27-73(b) to Increase the Building Height in a C-1 (Local Commercial) District from 2 Stories/35 Feet to a 16 Story Office Building and 10 Story Hotel. FIRST READ: Ordinance Amending Chapter 16, Land Development, Regulations, Article II,Environment and Natural Resources, Division 6, Tree Preservation. Construction Process and Affirmation to Utilize Comprehensive Program Services for Parks Projects. Due to the storm last week, a special called meeting was initiated by Mayor Shortal to take action on a few things that couldn't wait until the next regular meeting. City Council, Planning Commission and Zoning Board of Appeals 2018 Meeting Schedules. Approval of SPLOST Resolution, SPLOST Budget Assignment & Financing Limits, and Authorization for Mayor to Execute SPLOST IGA with DeKalb County. Open Public Hearing on Consideration of Suspension or Revocation of Alcoholic Beverage License for BP Gas Station, 4485 Ashford Dunwoody Road, Dunwoody, GA 30338, Licensee David Y. Kwon, License Number 3677. Open Public Hearing on Consideration of Suspension or Revocation of Alcoholic Beverage License for BP N. Peachtree, 4368 N. Peachtree Road, Atlanta, GA 30338, Licensee Shahin S. Uddin, License Number 3679. Open Public Hearing on Consideration of Suspension or Revocation of Alcoholic Beverage License for Eclipse Di Luna, 4505 Ashford Dunwoody Road, Dunwoody, GA 30346, Licensee James N. Ehrlich, License Number 3701. 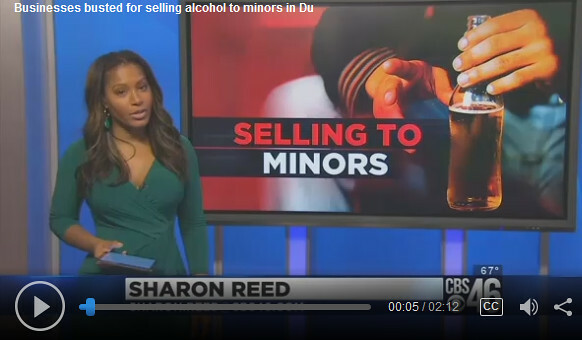 Open Public Hearing on Consideration of Suspension or Revocation of Alcoholic Beverage License for Outback Steakhouse, 1220 Ashford Xing, Dunwoody, GA 30346, Licensee Outback Steakhouse of Florida, LLC, License Number 3726. Open Public Hearing on Consideration of Suspension or Revocation of Alcoholic Beverage License for Total Wine & More, 124 Perimeter Center West, Dunwoody, GA 30346, Licensee Susan E. Anderson, License Number 3751-RET. Open Public Hearing on Consideration of Suspension or Revocation of Alcoholic Beverage License for Chuy's Mexican Restaurant, 118 Perimeter Center West, Dunwoody, GA 30346, Licensee Chuy's OPCO, Inc., License Number 3866. The ceremonial groundbreaking event will celebrate the beginning of construction for the new ballfields at Brook Run Park. 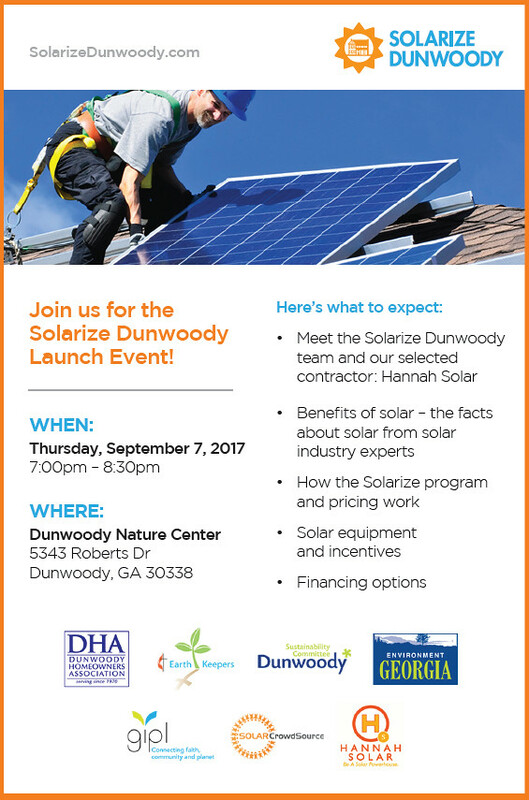 Please join City of Dunwoody Council members, city partners, and city staff for the celebratory event. 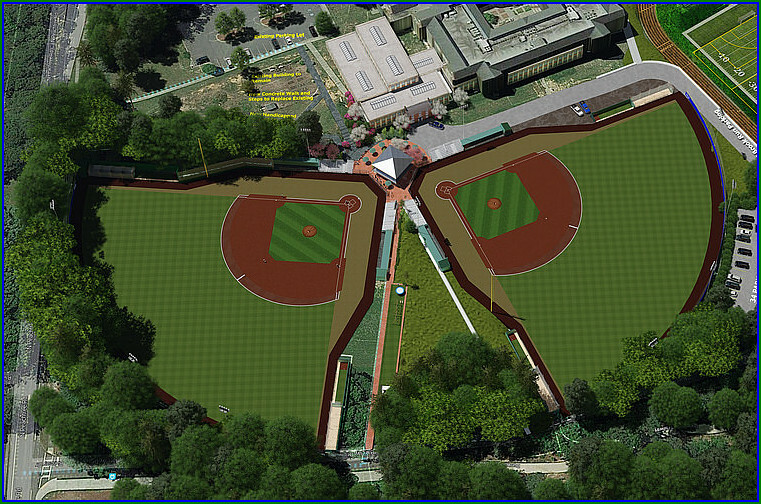 The two new fields, which will also serve as the new home for Dunwoody Senior Baseball, will have rectangular multi-purpose field overlay/striping complete with a durable all-season synthetic turf. The fields will be set-up for shared use by Peachtree Charter Middle School for the school’s gym and outdoor classes. The facility will also include a new concession building, new bathrooms, a playground, bleacher stands, batting cages, and parking. The fields will be located at the corner of North Peachtree Road and Barclay Drive, an eight-acre property adjacent to Peachtree Charter Middle School. A new bus turn around and drop off with ADA access and handicap parking will also be included at the new site. A lunch will be served for attendees following the groundbreaking celebration. PARKING: Please park at Brook Run Park by the pavilion (about midway down South Georgia Way in Brook Run Park) and then walk towards the multi-use trail/Barclay Drive where there is a crosswalk which leads to a paved access road/fire lane onto the site. 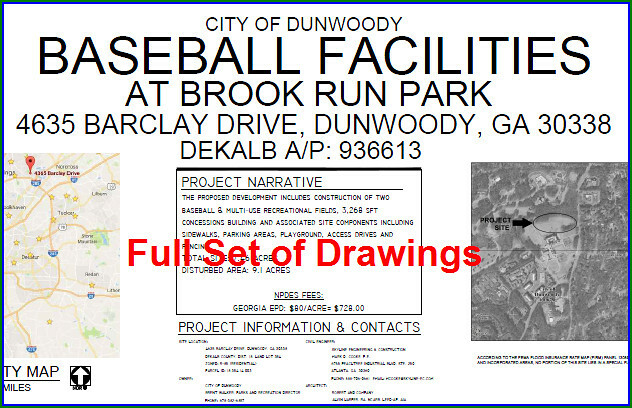 Attached below are the final set construction drawings for the ballfield facilities which the included numerous cost cutting measures to get the total cost down to the budged $5.6 million. The City explored doing underground water detention under the new parking lot but it was a $600K price tag and therefore not recommended. Dunwoody's Mayor Denis Shortal releases proposed 2018 budget for City Council consideration. A U.S. Supreme Court Justice, a U.S. Senator, an Atlanta Mayor and the Bush Sisters will all be hanging out in Dunwoody at the Marcus Jewish Community Center this November. » 3:00 pm GAIL SALTZ, The Power of Different DYLAN DICKSON, Why Can't I Read? » 12:00 pm LISA LILLIEN, Hungry Girl: Clean & Hungry Obsessed! » 7:30 pm DAVE BARRY, ADAM MANSBACH & ALAN ZWEIBEL, For This We Left Egypt? Georgia Power has been notified of various trees on power lines and City of Dunwoody crews can not work until cleared. Four trees on Brookhurst down, power on the ground & pole will need to be replaced. Georgia Power is working their service list based on their various priorities (public safety, granting access for fire trucks to isolated roads with limited access points, number of people affected, etc). Once Georgia Power clears the line out of each work zone, the City of Dunwoody has a crew assigned to follow and clear the street. 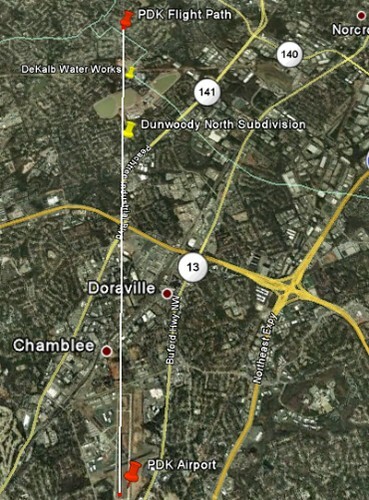 Therefore to alleviate any chance of a communication breakdown, if you see Georgia Power truck working a major outage but don't see a City of Dunwoody crew ready to clear the road, the Public Works Director has asked that a call be placed to the Dunwoody Public Works after hours number of 678-382-6700 notifying them of the work being done. After weathering one of the largest storms to hit our state, Georgia Power continued with restoration efforts today. Power outages associated with Hurricane Irma impacted nearly 1 million of our customers all across Georgia. As of 7 p.m. Tuesday, we have restored service to approximately half of those customers. Currently, there are about 470,000 customers without power in Georgia. The Metro Atlanta area has seen similar gains in restoration today, reducing the number of outages to around 200,000 of which ~50,000 are in North Metro Atlanta. We plan to move additional workers into the area tonight and will continue to assess and make repairs based on our assessment tomorrow. We understand that many of your constituents are frustrated that their power has not yet been restored. The damage and outages to our system are widespread across the state, and in many cases the damage is severe. This is an unprecedented event for our state, and resources are stretched thin as utilities respond to two major storms that not only impacted our state, but also devastated parts of Texas and all of the state of Florida. While our crews are working around the clock to restore service, customers should plan ahead for extended outages that may last for days, and in some cases weeks due to the vast damage from the storm. Please see the updated list below. Officer Parson just spoke with Georgia Power on Tilly Mill Rd and was informed they have more crews just arriving into the area. 1. Tree and wires down on Chamblee Dunwoody Rd at Harris Circle. Currently one lane open. 09/12/17 1345. 2. Wires down on Summerford Drive near Summerford Court. Summerford Drive blocked. 09/12/17 1356. 3. Large tree and wires down on Brookhurst Dr and Dunhaven Rd. 09/12/17 at 1501. 4. Tree and wires down on Brendon Dr near Dartford. Brendon blocked. 09/12/17 at 1523. 5. Wire down on Mount Vernon Rd at Dunwoody Village Pkwy. One lane of Mount Vernon Rd EB coned off. 09/12/17 1408. 6. Wires/tree down at 2338 N Peachtree Way. N Peachtree Way partially blocked. 09/12/17 1509. 7. Wire and pole down on Nerine Cir. Nerine Circle blocked by tree/wires. 09/12/17 1446. 8. Wires down on Mt Vernon Way at Summerset Dr. Mount Vernon Way blocked. 09/12/17 at 1414. 9. Tree and wires down at Vernon Oaks and Tichenor Ct. Road blocked. 09/12/17 at 0626. 10. Tree down 4630 Ellisbury Drive. 09/12/17 0900. 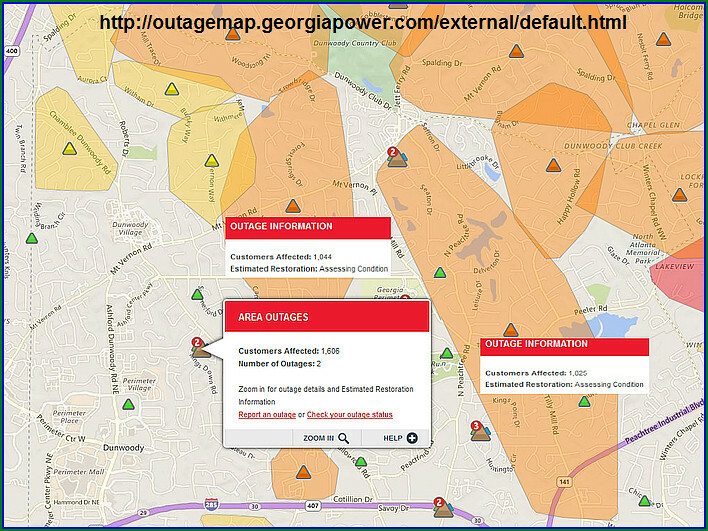 Dunwoody Power Outages and Downed Trees are widespread throughout the City - assist your neighbors if you are able. The Dunwoody Police Department and Public Works crews have cleared as many locations as possible in the city and are awaiting further assistance and help from Georgia Power to address remaining dangerous power lines and trees. 1. Tree and wires down on Chamblee Dunwoody Rd at Dunwoody Knoll 09/11/17 at 1509 **UPDATE** Chamblee Dunwoody Rd will be blocked on both side from Harris Dr. 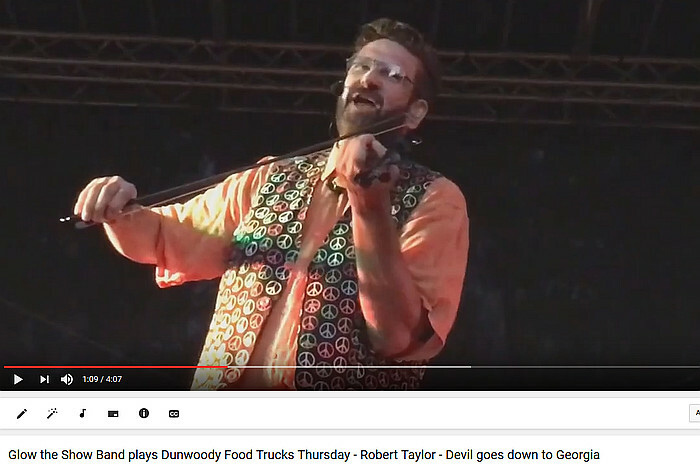 Anyone on Dunwoody Knoll Dr will have to travel through Roberts Dr.
2. Wires down 1400 Block of Summerford Court. 09/11/17 at 1549. 3. Wires down 5100 Block of Mount Vernon Way. 09/11/17 at 1549. 4. Tree down 5500 Block of Woodsong Trail. 09/11/17 at 1549. Tilly Mill @ Peeler Mt. Dunwoody Police Department and the City of Dunwoody will continue Emergency Operations Center (EOC) efforts to respond efficiently to all of the weather related events in @DunwoodyGA. Hurricane Irma continues to impact service to Georgia Power customers across the state. The company is responding to these outages where possible, but in many cases our approximately 5,500 personnel from the company, other Southern Company operating companies and assisting utilities must wait for the high winds to subside before they can safely make repairs to our system. As expected, Irma has taken a more westerly track than was predicted on Friday. All of Georgia, including the Metro Atlanta area, is experiencing high winds and heavy rains. As of 5 p.m. Monday, there are more than 900,000 customers (almost 50% of our total customers) without power in Georgia and over 7,000 individual cases of damage (including broken poles and lines) the company is working to repair. The damage and outages are widespread across the state with the hurricane impacting service to customers around Savannah, Columbus, Metro Atlanta and beyond. Over the last few hours, conditions in the Metro Atlanta area have deteriorated rapidly with steadily increasing wind speeds. As expected the winds have caused outages in our area to increase significantly. Currently Hurricane Irma has interrupted service to nearly 400,000 customers in the Metro Atlanta region. As the higher winds move through the area this evening, we expect these numbers to increase. As you may recall, we made the decision to hold all Georgia Power resources at our local offices so that we can respond to any damage in metro Atlanta. Once conditions are safe, our crews will begin to assess the damage and begin repair to our system and restore electric service to our customers. Dunwoody brace yourself for Irma - be prepared for power outages. Check on neighbors who may need assistance. Due to Hurricane Irma, Georgia Governor Nathan Deal has declared a state of emergency for all Georgia counties and closed State offices tomorrow, September 11, 2017. Following the guidance within the Governor's declaration, the City of Dunwoody will close City Hall on Monday, September 11, 2017, with the exception of essential law enforcement positions. The Dunwoody City Council meeting originally scheduled for Monday September 11, 2017 has been postponed until 6:00 pm on Monday, September 18, 2017 due to the impending inclement weather from Hurricane Irma. The City of Dunwoody, DeKalb County, and the entire metropolitan Atlanta area is under a tropical storm warning. As Hurricane Irma moves north, the City of Dunwoody is keeping a close eye on reports from the National Weather Service, the National Hurricane Center and the Georgia Emergency Management Agency to aid in this effort. DeKalb County Sanitation Department announced there will be no sanitation collection service for commercial and residential customers on Monday, Sept. 11, due to inclement weather. Information outlining the collection schedule for the remainder of this week will be provided soon. The Division's administrative office will be closed on Monday, Sept. 11, and Tuesday, Sept. 12, reopening during normal business hours on Wednesday, Sept. 13. Placing garbage, recycling or yard trimmings containers at the curb during high winds can be dangerous, so residents are urged not to do so on Monday. Please visit https://www.dekalbcountyga.gov/sanitation/about-sanitation for updates. Out of an abundance of caution for the safety of its students and employees, the DeKalb County School District (DCSD) will close all schools and offices on Monday, Sept. 11, 2017, and Tuesday, Sept. 12, 2017, due to potential inclement weather caused by Hurricane Irma. The City of Dunwoody has partnered with CodeRED to send critical communications to you by phone, e-mail, and/or text message. Sign up to be alerted about severe weather warnings, evacuation notices, bio-terrorism alerts, boil water notices, and missing child alerts. This service is offered at no charge to Dunwoody residents. Click here to register. Please check the homepage of the City of Dunwoody website for any modification to hours of operation for City Hall at www.dunwoodyga.gov. Before the storm arrives it is important to establish a plan for appropriate disaster preparation. The Georgia Emergency Management Agency website has important information and planning advice. Please visit ready.ga.gov today to develop a safe plan of action. When a power outage occurs, please contact Georgia Power at https://customerservice2.southerncompany.com/Outages/Report/Location?mnuOpco=GPC&mnuType=res. If it is a dangerous condition, including downed power lines, please call 1-888-891-0938. In an effort to enhance storm communications to customers, Georgia Power has launched a new service that allows you to Set Outage Alerts. When a power outage occurs, Georgia Power will notify you by text, email or phone call with the cause of the outage and an estimated restoration time. If you are concerned about the safety of a neighbor or family member who may be in danger, sick, or home-bound, please dial 9-1-1. 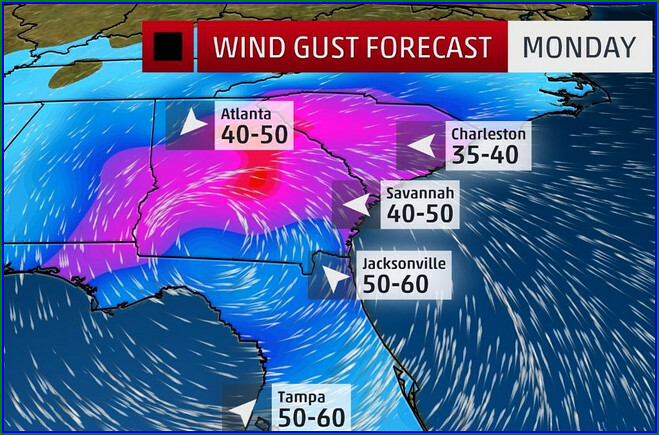 Damaging winds: Sustained winds of 40 to 60 MPH with gusts of 50 to 80 MPH are likely across much of Georgia from Monday morning to Tuesday morning. Portions of Southwest Georgia could see higher values. This will lead to widespread trees and powerlines down with prolonged power outages expected. In addition, structural damage is possible, particularly from falling trees. Thousands of trees and power lines will be downed, with many likely to fall over roadways, power lines, structures, and vehicles. Travel disruptions and delays due to downed trees may be substantial. Winds of this magnitude will cause impacts comparable to those of Hurricane Opal in 1995 when wind gusts of 50 to 75 MPH occurred in the Atlanta Metro area. Heavy rainfall and flash flooding: Rainfall amounts in Southeast Georgia of 8 to 12 inches are expected, with 3 to 8 inches forecast for the rest of Georgia. Some areas could see isolated higher amounts. This will create the potential for flash flooding, and a few rivers may reach minor to moderate flood stage. Gov. 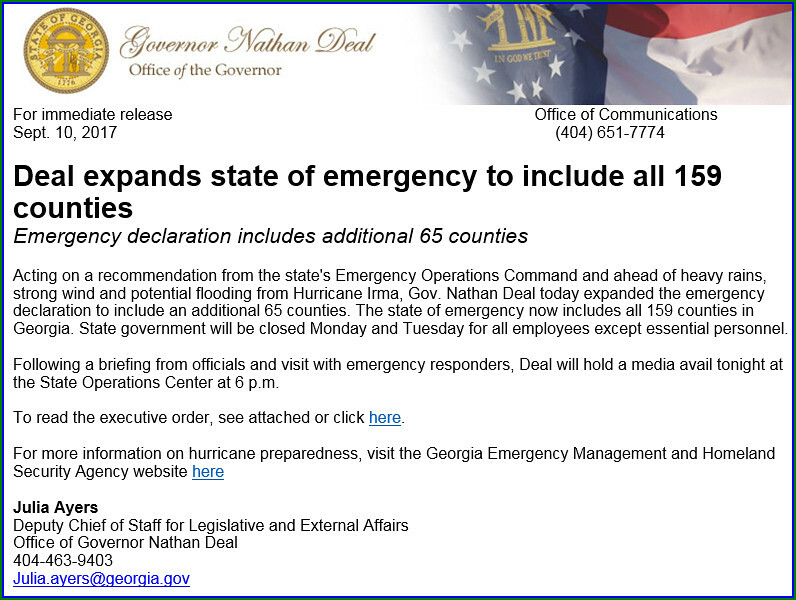 Deal orders state of emergency for State of Georgia - all Federal, State & Local offices closed on Monday. Due to Hurricane Irma, the Governor has declared a state of emergency for all Georgia counties, and he has closed State offices tomorrow. The City of Dunwoody will be closed on Monday, September 11, 2017, with the exception of essential law enforcement positions. The City Council meeting for Monday has also been canceled and will be rescheduled. A decision about City operations for Tuesday, September 12 will be announced sometime after 3pm on Monday. The DeKalb and Fulton County School Districts have announced they will close all schools Sept. 11 and 12 due to potentional inclement weather caused by Hurricane Irma. 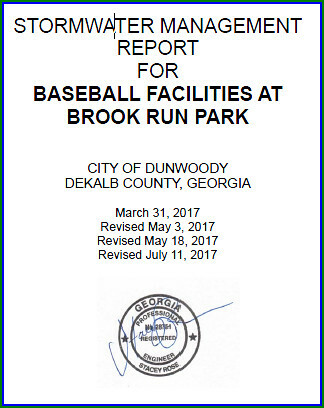 City of Dunwoody's plans for two new athletic fields moves forward, tree loss unavoidable over Council concerns. After numerous design modifications and cost saving negotiations with the builders to install two full size, artificial turf baseball fields on the newly acquired park land obtained during a land swap with the DeKalb County School System for Austin Elementary, it has been determined that many, if not all of the trees surrounding the fields at North Peachtree Rd.& Barclay Dr. will need to be removed. I am not happy with the design decision as with every major discussion of this project I have raised the issue of protecting the neighbors who live on either North Peachtree Road or Riverglenn Circle from the illumination of the playing field. In the latest change, the fields were moved further away from North Peachtree Road in order to not have a huge retaining wall and my hopes for the change included more trees being saved but I was informed this week that unfortunately, it was not the case. Currently, 296 trees are slated for removal. Mr. Brent Walker, Parks Director stated that... "Due to the size of the fields and the area we have to work in, we will have to grade the slope along North Peachtree Rd and Barclay Dr. This will require the removal of the trees. We will work with the contractor to minimize the impact as much as possible and through the City's "No Net Loss of Trees Policy" we will replant a one for one ratio for the trees removed. Several on the site. We expect clearing and grading to begin the end of next week or the first part of the week after. I am happy to work with you and your neighbors when we begin to re-landscape the area and try to accommodate any requests you have for tree and shrubbery replacement." As Mr. Walker stated the City does have a "No Net Loss of Trees Policy" for City projects therefore many of the trees & shrubs will be replanted on site but it will take a few years for the landscaping to get to a size to protect the neighbors across the street. The landscaping plan is not set in stone therefore once the fields are installed and the lights illuminated, it can be a community discussion as to the scope of landscaping plan. The plan also includes new sidewalks on Barclay as well as refreshed landscaping in that area of the park. The city is investing in the latest lighting technology whereby with the use of LED lights there will be little light spill over off the fields therfore the hope is that the lights will be unobtrusive to the neighbors. The new field designs were vetted with Principal Heptinstall and the athletic coaches of PCMS, the PCMS Parent Council, Dunwoody Senior Baseball as well as oversight of the City Council attempting to squeeze as many positive features into this $5.6 million dollar project. 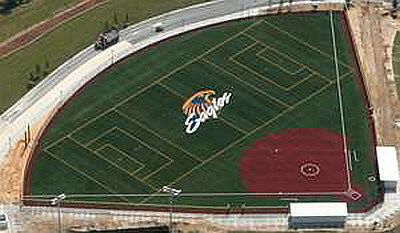 The fields will be laid out for baseball but they will be stripped for multi use including soccer & lacrosse in the outfield as well as have a seperate layover striping for girls softball. 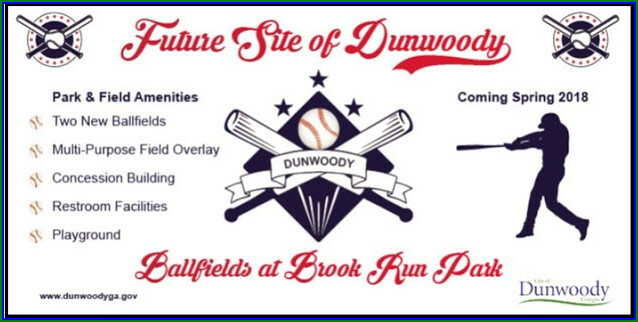 The total cost includes all construction, turf, concession stand, plaza, lighting, batting cages, dugouts, etc and I imagine that this will be a transformational project for our community which will impact Dunwoody middle school students at PCMS & thousands of athletes over the next twenty years. My guess is that construction will be messy and much like the heartache of cutting the Brook Run Trail through the woods, with a few years of growth it will be a beautiful facility that the entire community can be proud of. For the first week of the campaign, if you add the promo code LIFTOFF at checkout, your donation will be doubled up to $50! Our high school marching band is a vibrant, enthusiastic group of students who love their band program and school! We work hard to achieve excellence which begins with summer camp in July. Students may participate in concert band, symphonic band, as well as the Georgia Music Educators Association Small and Large Group Performance Evaluations. Our marching band program is an integral part of the overall program. One hundred percent of funding for our programs comes from band dues, fundraising and donations. It is extremely important that we are there for our students when they are in need. Music is our passion and will be with us for the rest of our lives. The drum major of a marching band has the honor of holding one of the most important positions. They are the leader and everyone looks up to him or her for inspiration and guidance. A new podium will allow us to provide the best opportunity for our students and will enable smooth set up and take down during games and marching band competitions. This is a larger podium that we currently have which will allow for more than one drum major to practice at the same time. It will also give our aspiring drum majors a platform to train together with our experienced drum majors. PDK Advisory Board position available for citizen participation. My friend and former President of the Dunwoody North Civic Asociation, Mr. David Fowler has served on the Peachtree DeKalb Airport Advisory Board since 2002 where he advises on airport issues from a local citizen perspective. Mr. Fowler recently married and moved outside DeKalb County, therefore, he will need to step down from the board where he has lobbied for many years to limit airplane noise on behalf of our community. Mr. Fowler believes it is critical for us to help DeKalb Commissioner Kathie Gannon find someone who can walk the line between citizen and government and give Kathie valuable feedback when needed. The meetings are the 2nd Monday of each month and average about an hour each. The airport management usually presents issues of concern and the public is afforded time for comment each month. The AAB then makes recommendations to the commissioners. If anyone is interested in serving on the committee, Commissioner Kathie Gannon can be reached directly by email at kgannon@dekalbcountyga.gov and if someone wants to talk to Mr. Fowler directly about the duties of position I can connect you - just reach out to me. Finally, I would like to thank Mr. David Fowler for his many years of tirelessly serving our community and I wish him and his bride many years of happiness. Local rivalry & great community turnout to watch the game, cheerleaders, & half time show.